It has been an amazing summer in Edmonton this year, a hot long summer that has allowed plenty of patio gatherings, BBQ grilling, friends’s parties. We’ve had quite a few BBQ backyard dinner invitations from our friends around the city and we’ve always contributed with making something. A dessert is often highly appreciated and, since I don’t mind baking at all, I suggest we bring one most of the times. And they always say yes 🙂 . One of our friends is gluten intolerant, but that doesn’t worry me the least, I’ve already baked for him, plus I really enjoy baking with gluten free flours. 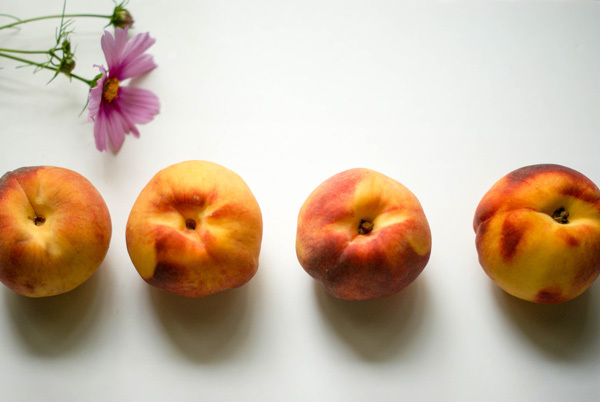 Since it is a summer dinner on the patio I thought immediately that it had to involve some fruit, and peaches were in our fridge waiting to be utilized at their best. 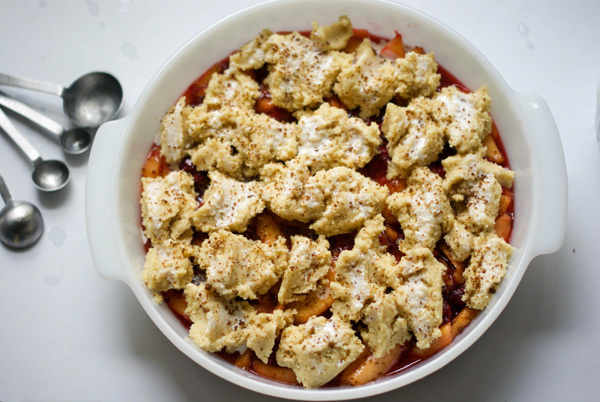 So here it is: Gluten-free Peach and Raspberry Cobbler. 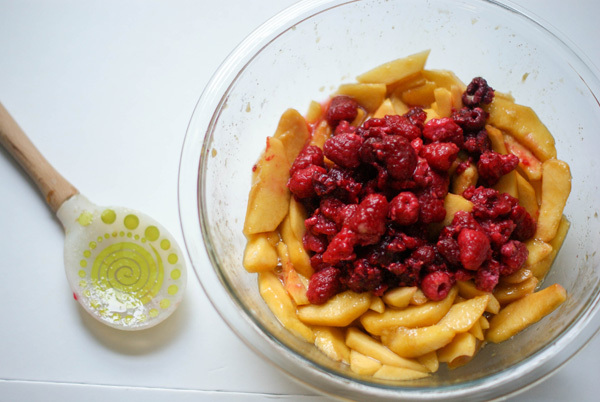 The combination of peaches and raspberries is a winner. Their flavor combined is out of this world good! About the flours: I used -again- brown rice and chickpea flour combined. If you’ve never tried, please give it a go, you will love the texture and the lovely mild sweetness. 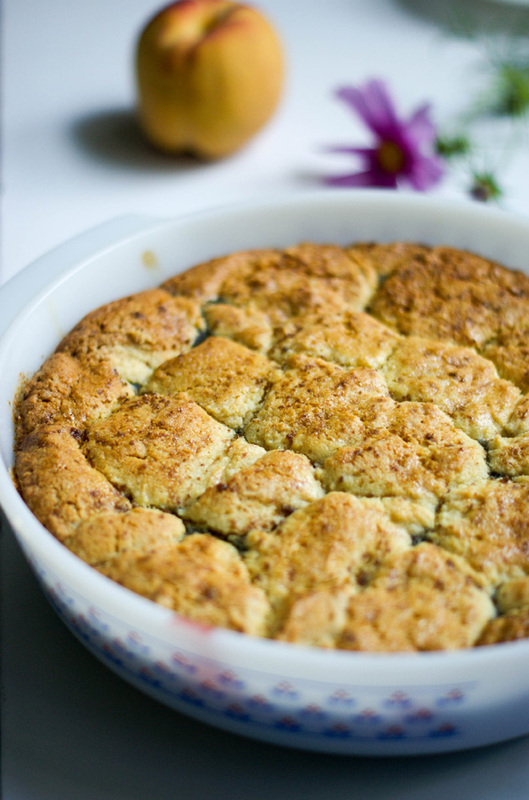 Once baked, they gave the cobbler a crispy top, a soft yet crumbly inside melded by the juices of the fruit. The raspberries, frozen this time, give a beautiful crimson color to the cobbler with a bit of tartness subdued by the sweetness of the peaches. Once again, and still to my surprise, it was a success. With a dollop of vanilla ice cream on top, the only sound heard was the clinging of the spoons on the plates, that were polished quickly and thoroughly. In a large bowl, toss together the fruit, sugar, salt, lemon juice and potato starch. Transfer to a 13-inch round gratin dish. Set the oven rack in the middle position. Preheat the oven to 375°F. To make the biscuit dough: In a large bowl, whisk together the flours, sugar, baking powder, baking soda and salt. Working quickly so as not to warm the butter, work the butter into the dry ingredients with your fingers until the mixture resembles coarse crumbs. Add the whipping cream and fold with a spatula until it has been absorbed. Do not overwork. The dough will be wet. Spoon dollops of biscuit dough on top of the fruit. (The dollops will spread and join with one another as the cobbler cooks). Brush the dough with whipping cream and sprinkle some brown sugar. Bake until the biscuit topping is lightly browned and cooked through, 30 to 35 minutes. We usually don’t like to impose on our hosts the process of taking pictures, so the last one is a stolen shot taken with our cell phone, and it shows what was leftover after serving 6 ravenous people. Consequently, the host hid the leftover cobbler right away and I was handed the washed dish 😉 . Another great night sharing good food, lively chats and irresistible laughs with wonderful friends. This is the life! 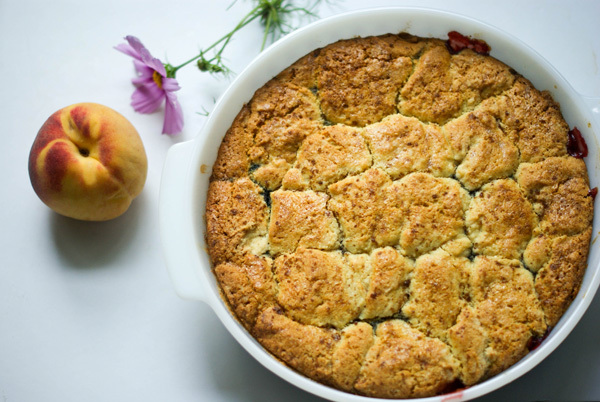 I’ve actually never made a cobbler before so you definitely have inspired me here with this recipe. I just love how its gluten free too! Thanks Thalia for your nice comment. I love your website, by the way! I am so into the brown rice and chickpea flours combination! I experiment with many different flours in my baking, but these two are my favorite. 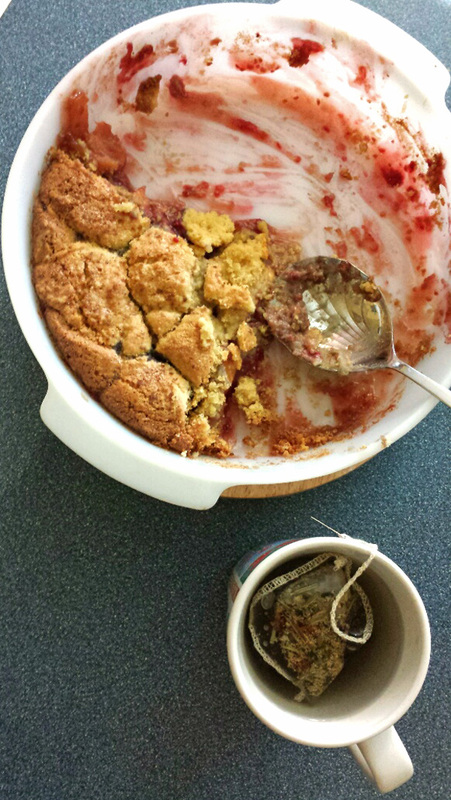 This cobbler was a hit! Lovely it is :)! Hungry 🙂 want it right now! Thanks for stopping by, Suki! It was really delicious and so easy to make! Beautiful! It’s just that time of year where these kinds of desserts always make me want to get in the kitchen. Thanks Katrina. Yes, the beautiful scent of a crisp or cobbler baking in the oven is just unbelievable!